Check here to see the latest additions to our movie collection! To place a hold on a particular title, click on the title of the film and then click "Request" at the top of the page. Enter your name and library card number and click "Submit." 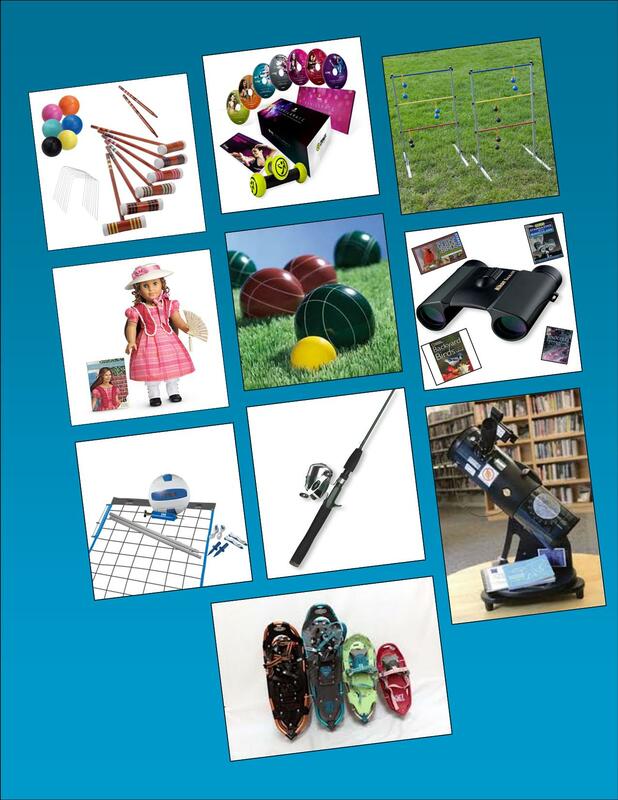 McArthur Library offers a wide range of recreational items for you to borrow, in the interest of promoting healthy lifestyles for you and your family. These items are intended to encourage you to try new hobbies, as well as spend time out exploring (whether on snowshoe or by car). Snowshoes are seasonally available and check out for 1 week; other items in the recreation collection check out for 3 weeks. Overdue fees are $1.00/day for all items. Items in the recreation collection may not be loaned to other libraries and are available to borrowers 18 and older with a McArthur Library card and a current ID. The telescope requires a valid Maine driver's license and must be transported by a vehicle. Check out our passes to the Maine Wildlife Park and local museums! The Children's Museum of Maine--enjoy a 50% discount on admission for family groups of up to four. The Portland Museum of Art--take in some art with free admission for no more than 2 adults and up to 6 children. The Maine Wildlife Park -- spend the day outdoors visiting animals native to Maine using this pass to discount the entrance fee to $3.00 per person. Please call the Children's Room at 284-4181 to reserve a pass -- we can issue only one pass per park/museum per day. Did you ever wonder how much energy a specific appliance in your home uses? What does running that old refrigerator cost? Toaster Oven? Portable electric heaters? Computer? Or other electronic device? Get to the bottom of your high electric bills using a Kill-A-Watt Energy Monitor. The McArthur Public Library has six portable monitors that the can be borrowed by any card holder – just like a book. The monitors are easy to use and work on any standard 120-volt electric appliance. Instructions are included. Simply plug any appliance into the front of the Kill-A-Watt Monitor and plug the Kill-A-Watt Monitor into the wall outlet. The monitor measures voltage, electricity cost and electric consumption and exact operating cost of using an appliance. The monitors can help you identify the possible causes of high energy use, predict savings in reducing use or calculate the payback for replacing older equipment. You can also discover how much power some appliances draw even when they are switched “off ” (phantom power). Efficiency Maine has distributed 650 Kill-A-Watt electricity monitors to public libraries across the state. Efficiency Maine is a statewide effort to promote the more efficient use of electricity, help Maine residents and businesses reduce energy costs, and improve Maine's environment. Efficiency Maine is funded by electricity consumers and administered by the Maine Public Utilities Commission. Just check it, plug it in, and start saving energy and money right away. For more information about the Kill-A-Watt program, call the McArthur Library Circulation Department at 284-4181.